SCOTT AIR FORCE BASE – Since the Scott Air Force Base Exchange opened in 1972, Margo Gobin has been a fixture in the community, serving Airmen, retirees and families with her can-do spirit. Now, after spending 43 years—more than half her life—dedicated to Team Scott, Gobin is bidding farewell. The 80-year-old associate, who works on the sales floor in the health and beauty department, is retiring March 31. Gobin helped open the Scott Exchange in 1972, working as a stocker. Her husband was an Airman assigned to Scott, and once the youngest of their four children started school, Gobin decided to look for work. The Exchange was a natural fit. During her career, Gobin has worn many hats, working at the jewelry counter, as an office clerk and Express manager. For 43 years, she’s kept going strong—except for four months back in 1999, when she retired for the first time. That retirement lasted just four months. She’s seen many changes over the decades—including the introduction of computers in the workplace—but her dedication to Team Scott has remained constant. One of her favorite parts of her job was getting to know the Airmen at Scott, not just as customers but as friends. Gobin, with her long Exchange tenure, is in good company at Scott. Her fellow associate Carol Potts, a logistics assistant, has been with the Army & Air Force Exchange Service since 1977, working at Exchanges around the world and serving Team Scott for more than 10 years. And, Scott Exchange associate Joyce Roberts began her career with the organization in 1974. Together, Gobin, Potts and Roberts have 121 years of service. Air Force Chief Master Sgt. 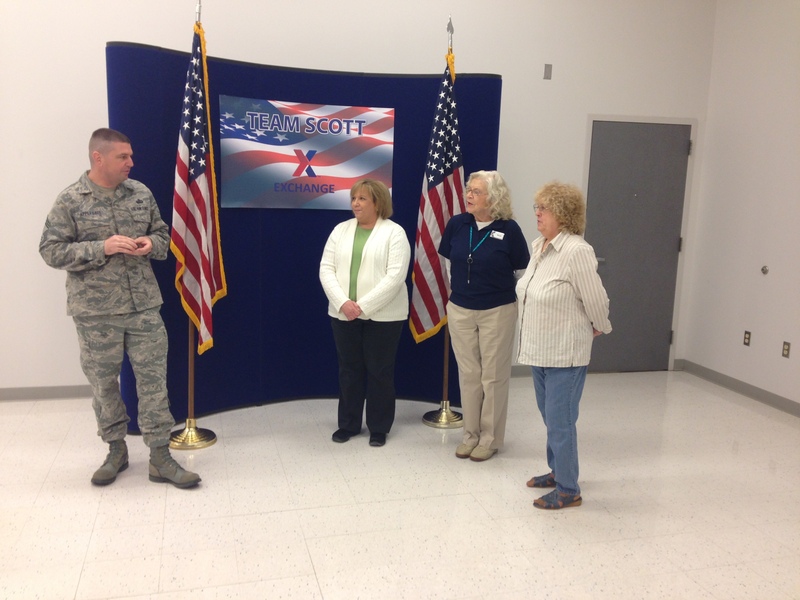 Sean Applegate, the Exchange’s senior enlisted advisor, honored the women during his recent visit to Scott AFB, presenting them special coins for their service. Exchange General Manager Ralph Kleemann calls Gobin, Potts and Roberts shining examples of the organization’s commitment to taking care of service members. Gobin plans to leave quietly, with no grand party in her honor. And that’s how she wants it. Soon, she’ll be heading to Vermont to be closer to family. 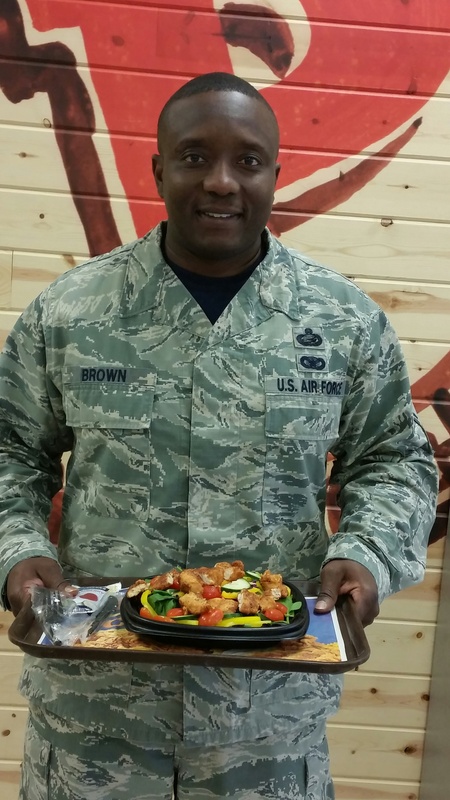 DALLAS – As part of its BE FIT initiative, the Army & Air Force Exchange Service is now offering an Exchange-exclusive, healthy salad at select Popeyes locations in the continental United States. The signature blackened chicken salad, which contains only 300 calories and 14 grams of fat, was created exclusively for the Exchange by Popeyes as part of the Exchange’s “Better for You” meal options. After a test run at Fort Campbell in 2013 and consumer feedback surveys last year, the salads launched at the end of 2014 and are now part of the regular menu offerings at Popeyes. Popeyes, which operates at 43 Exchange locations in the continental United States, also offers its Louisiana Live Well menu with 20 items, all 350 calories or less. BE FIT is a program that offers healthier choices to authorized shoppers in the Exchange’s Main Stores, Expresses, vending machines, food courts and school meal program. It also covers athletic apparel and workout equipment in an effort to promote a healthier mind and body. DALLAS – As March Madness heats up, Army & Air Force Exchange Service shoppers have a chance to win big with the Unilever Sweepstakes. Now through April 9, the Exchange is offering shoppers worldwide the opportunity to win one of six $2,500 Exchange gift cards. “This is a great opportunity for families to score that big screen television, surround sound system or tablet,” said Air Force Chief Master Sgt. Sean Applegate, Exchange senior enlisted advisor. To enter, shoppers can simply visit their local Exchange, locate the Unilever Sweepstakes display and fill out an entry form. Entrants must be 18 years or older with a valid driver’s license. Six winners of the Unilever Sweepstakes will be notified on or about May 7. No purchase is necessary and there is a limit of one entry per family. 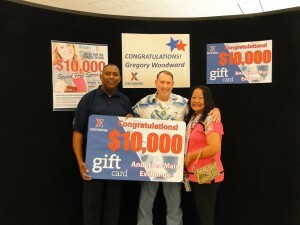 DALLAS – Two military retirees had luck on their side in the Army & Air Force Exchange Service’s Spend Free Spree contest, each taking home a share of $12,000 in gift cards. Retired Coast Guard Chief Petty Officer Gregory Woodward claimed the grand prize—a $10,000 Exchange gift card—during a presentation at the Andersen Air Force Base Exchange in Guam. For Woodward, the $10,000 prize was a bright spot during a trying time for he and his wife of 37 years, Rose. He learned he won right after his wife was discharged from the hospital after suffering from heart problems, for which she will need a pacemaker to regulate. “My elation was mixed with the seriousness of my wife’s situation, but we are very grateful and appreciate all the Exchange has done for us over the years,” said Woodward, who spent 24 years in the military, serving in the Navy and the Coast Guard, retiring in 2000. He and his wife are traveling to Hawaii for more medical treatment and will wait until they return to Guam before spending their prize. Retired Air Force Maj. Gerald Daub received a $2,000 Exchange gift card, the second-place prize, during a presentation at Fairchild Air Force Base. Daub is no stranger to winning contests. He and his wife, Loy, plan to put their winnings toward new items for their home. “I did tell her to pick out something special so we have something to show for winning,” Daub said. The Spend Free Spree contest, which received more than 11,500 online entries, was part of the Exchange’s Because of You campaign, a yearlong effort to recognize and reward service members’ sacrifice and dedication to our country. DALLAS – Maj. Chris Hormel, Tech Sgt. Nicholas Lakey and Airman Nicholas Wedlow all have a way with words. Their passion for writing helped them win the top prizes in the Army & Air Force Exchange Service’s “Proud to Serve” essay contest. Hormel, who serves with the 18th Military Police Brigade at U.S. Army Garrison Bavaria, took home the grand prize—a $10,000 Exchange gift card. He received his prize during a presentation March 11 at the Grafenwoehr Exchange. In his essay, Hormel talks about his grandfather’s service during World War II. Hormel, who has served nearly 16 years in the Army, says he’s always humbled to visit cemeteries and see veterans’ ranks listed on the gravestones. “They want to be remembered for their service—and that’s the story I was trying to tell with my essay,” he said. 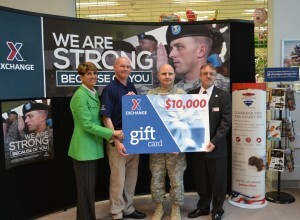 Lakey, who serves at Aviano Air Base, Italy, took second place and a $5,000 Exchange gift card. In his essay, Lakey recalled seeing yellow ribbons tied around trees in his neighborhood in 1991 during the Gulf War. He was only 6 years old. His father explained that the ribbons were to honor the troops serving in the war. “I asked if everyone got to come home and my heart sank when I found out that many people gave their lives to achieve victory,” Lackey wrote. That moment from Lakey’s childhood came full circle, when, as an Airman at Joint Base Balad, Iraq, he volunteered with Iraqi children, playing games and giving them gifts. The third prize—a $2,000 Exchange gift card—was presented to Creech Air Force Base Airman Nicholas Wedlow during a ceremony at the Nellis Air Force Base Exchange. Wedlow entered the contest after encouragement from his wife. He said he’s always enjoyed writing, and English was his best class in school. Air Force Chief Master Sgt. Sean Applegate, Exchange Senior Enlisted Advisor, praised all three winners. The “Proud to Serve” essay contest was part of the Exchange’s Because of You campaign, a yearlong effort to recognize and reward service members’ sacrifice and dedication our country. The three winning essays can be found at shopmyexchange.com/BecauseOfYou. DALLAS – Besides handling daily schoolwork, studying and tests, military students face unique challenges, including coping with separation from parents during deployments and multiple moves. In fact, according to the Military Child Education Coalition, military children typically move six to nine times by the time they’ve completed 12th grade, with many making multiple moves during high school. The Army & Air Force Exchange Service is rewarding military students who excel in the classroom with its You Made the Grade program, now in its 15th year. Students in first through 12th grades who maintain a B average or better are eligible to receive a coupon book filled with free offers and discounts. You Made the Grade offers for 2015 include free food items such as a Burrito Supreme or Taco Supreme from Taco Bell; small chicken Philly sandwich at Charleys; Popeyes Chicken Po’Boy; and a bacon double cheeseburger and small fry from Burger King. Students who make the grade will also score Snack Avenue coupons for a free fountain drink, including Yeti, a frozen carbonated drink, and a complimentary hot dog or roller grill item. Other offers include discounts on backpacks, shoes and more. Scholars can also enter the You Made the Grade semiannual sweepstakes to receive gift cards worth $2,000, $1,500 or $500. Entries for the gift card sweepstakes drawing can be submitted twice a year, with drawings typically held in June and December. Students, including those who are home schooled, can receive a You Made the Grade coupon booklet by presenting a valid military I.D. and proof of an overall B average at their nearest Exchange customer service area. Eligible students can pick up one booklet for each qualifying report card. Students and guardians can check with their local Exchange store manager for more information about the Exchange’s You Made the Grade program. DALLAS – Military shoppers can put some spring in their step with an extra discount on first-day purchases with a new MILITARY STAR® card at the Army & Air Force Exchange Service. Shoppers who use a new card for the first time from March 20 to March 26 will receive 15 percent discount on all purchases instead of the standard 10 percent discount that is regularly offered. The discount is valid in-store and online at www.shopmyexchange.com and can be combined with other promotions. The discount will appear as a credit on shoppers’ billing statements. Authorized shoppers can visit their local Exchange to apply for a MILITARY STAR® card. More information can also be found at www.myecp.com. DALLAS – The Army & Air Force Exchange Service knows that for Soldiers and Airmen, there truly is no place like home. With this in the mind, the Exchange is offering one lucky winner a home makeover valued at $18,000. Authorized shoppers can enter at shopmyexchange.com/BecauseOfYou from March 6 to March 31. One entry will be chosen at random to receive the prize. The winner of the $18,000 Home Makeover Giveaway will be notified no later than April 19. No purchase is necessary to enter or win. DALLAS – The Army & Air Force Exchange Service is encouraging shoppers worldwide to hop to it and take a crack at $3,000 in prizes. With the Patriot Family Easter Egg Hunt Contest, shoppers can search for clues at their local Exchange and post the correct answers on the Exchange’s Facebook page contest tab at www.facebook.com/AAFES.BX.PX. Shoppers can pick up a clue map at their local Exchange or download one from www.shopmyexchange.com/patriot-family. Four winners will take home a $500 Exchange gift card, and 10 winners will receive a $100 Exchange gift card. Winners will be randomly selected and notified by email. The contest runs March 6 through April 3. No purchase is necessary to win. Authorized Exchange shoppers can enter, and children younger than 18 must have their parents’ consent.